I love to cook. I own a million different cookbooks, follow a ton of food blogs and truly enjoy going to the grocery store…but sometimes I get stuck in a cooking rut or have weeks where I just can’t get to the grocery store but still want to cook inspiring meals for my family. 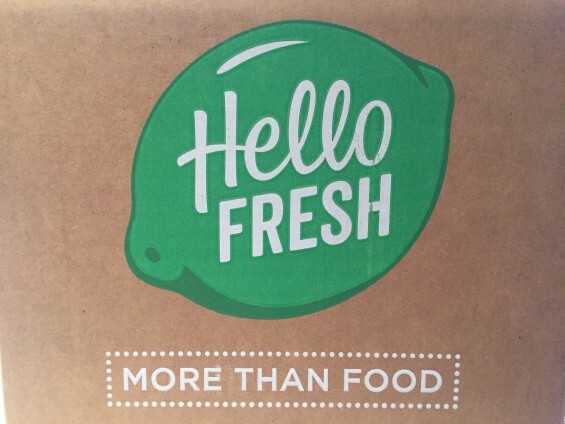 In comes Hello Fresh! A good friend of mine had been trying out their delivery service and was raving about her meals. She said that they were delicious and healthy and fun to make. So I decided to give it a try. I reached out to their dietitian (Yes, they have dietitians on staff!) and she graciously sent me a box for two to sample. The box arrived at my doorstep perfectly packages with the ingredients for each meal in separate labeled boxes and the protein packed separately on ice. The box contained recipes cards for each meal with beautiful pictures of the finished product as well as simple step by step instructions and photos. I couldn’t wait to get started. 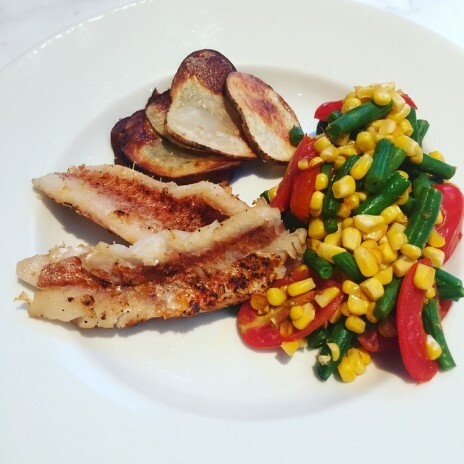 That night I made Bayou-Spiced Rockfish with Southern Succotash and Crispy Roasted Potatoes. I loved how the ingredient box contained everything I needed for that recipe in all the right amounts. It was fun to prep and cook everything and really did not take more than 30 minutes start to finish. To be totally honest, I didn’t love the fish. Maybe I didn’t add enough salt or pepper, but it didn’t have a ton of flavor. However we all LOVED the succotash and the potatoes. My kids both ate all of the veggies and they thought the roasted potatoes tasted like potato chips. If I tried to recreate this dish I would probably make a different fish, but use the recipes for the sides, they were great! The next night I made Smoky Adobo Chicken Tacos with a Mango Slaw and Lime Crema. This was a hit with the entire family. I don’t think my son had ever tried cabbage before, but he loves mango so he decided to give it a whirl…LOVED it! He has requested that I make this again at least once a week! It was a delicious and healthy combination of sweet and savory and looked so good. The recipe was meant for two, but it was enough to feed two kids and 1 1/2 adults (I was going out that night so I just had a taste!). This will definitely be in our regular dinner rotation! My final meal was Roasted Cauliflower with Bulgur, Tzatzki and Spiced Oil. It was delicious. I am a bit obsessed with roasted cauliflower. I probably roast a head or two every week! This recipe kicked it up a notch. The end product was perfectly cooked bulgur topped with tomatoes, cucumbers, roasted cauliflower, tzatzki sauce, pepitas, lemon zest, dill and spiced oil. It was delicious (and quite pretty!). The bulgur portion was quite generous, so I was able to add some of it to the kid’s dinner that night. I will definitely make this recipe again. Overall I think the meals were great. I always want to try out new recipes but hate buying a big container of an ingredient I may never use again. I love that each recipe here comes with just the right amount of each of those ingredients so I was able to try out different flavors. The portions were generous and the instructions were really simple to follow. I will definitely order Hello Fresh again (in fact I’m making one of their meals for dinner tonight!). What are you waiting for?? Check out their website www.HelloFresh.com and use code RAFCM26P for $40 off of your first box!! Happy cooking!